The Seven Sister States have been a challenge where the cuisine is concerned. All these states depend on locally grown vegetables, fruits and herbs. So far we cooked from the states of Assam, Arunachal Pradesh, Manipur, Meghalaya and now its Mizoram. Still got two more to go Nagaland and Tripura. The states we have covered so far tend to use quite a bit of meat for their everyday meals. Mizoram is no exception. Mizo Vawksa made from pork, Misa Mach Poora, made from shrimps, Paanch Phoron Torkari is a veg and non veg dish, Bai a dish whereby pork and veggies are mixed, Swahchiar a rice dish cooked with meat, fish or chicken. Koat pitha is popular in the Mizo Cuisine. Staple food is rice and most of the dishes are cooked in mustard oil. Meals tend to be bland and with little oil. They prefer to boil the vegetables and add meat, chicken or fish and serve it with rice. Mizoram means the Land of the Hill People. The mountains that run across the state and therefore wherever you look, you’re likely to find forest covered hills. It is believed that most of the tribes living in Mizoram migrated from the neighboring countries around 1500 A.D. Famous sport played there is football. The most famous dance from this state is the Bamboo Dance or Cheraw Dance. Education is important in this state and has the second highest literacy after Kerala. My partner for this month was Priya Iyer who blogs at The World Through My Eyes. She initially gave me rice flour and jaggery as my secret ingredients. I had to request her to change them as I’ve already prepare Koat Pitha. She then changed it to lettuce and green chili. I gave her cauliflower stalk and chilis. With the ingredients I gave her she made Cauliflower Stalk Bai. With the ingredients Priya gave me, it was obvious that the only way I could use them was to prepare a Bai. Bai is a healthy dish from the Mizo Cuisine. Its usually made either in a vegetarian or non vegetarian style. In the non veg version pork is usually used. 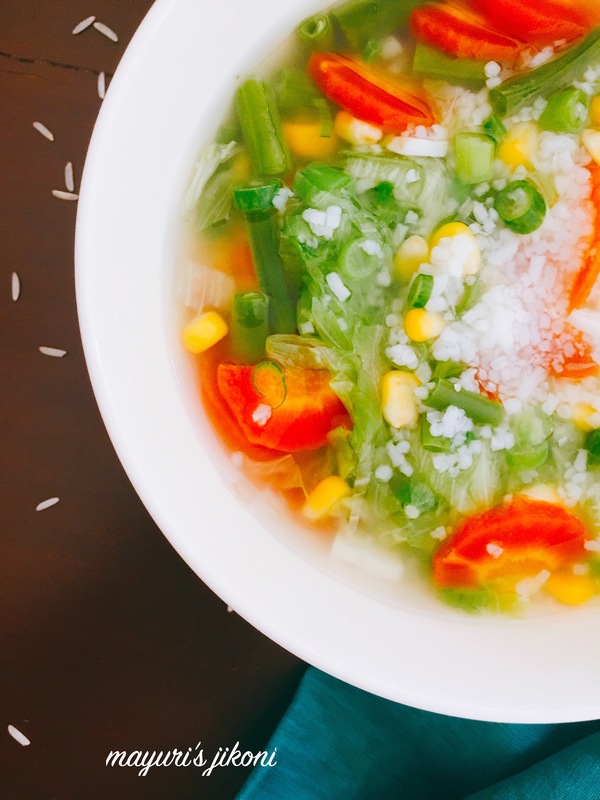 For the vegetarian version, vegetables that are locally grown and available are used along with a bit of rice.There is no limit to what kind of vegetables can be used.The Vegetables are added to boiling water along with salt and baking soda. Usually vegetables that take longer to cook are added first and then the ones that don’t take too long. In my version of Bai, I did not add baking soda as I don’t like the taste. I’ve also used some different vegetables to make it more interesting. So check out my version of Bai which hubby and I enjoyed as a super healthy soup. Peel and cut the carrot into cubes or slices. Chop the French beans into ½ -1 inch pieces. Slit the green chili into half. Wash the rice and keep it on the side till required. Bring 2-3 cups of water to a boil in a saucepan. Add the rice, French beans and sweet corn. After 5 minutes add the carrots, chilli and garlic. Let the vegetables and rice simmer over low heat till done. Add salt, lettuce and spring onions and simmer for 3-4 minutes. At this stage the mixture should appear a little thick because of the rice. Serve immediately. This dish can be enjoyed on its own. Use vegetables and greens of your choice. Can use spinach, pumpkin leaves, mustard leaves etc. Can add ginger to flavor the dish a bit. Potatoes are added to make it more filling. Shhh Cooking Secretly a group started by Priya of Priya’s Versatile Recipes, is where every month food bloggers are paired up and give each other 2 secret ingredients to cook with according to the theme chosen. If you’re interested in joining this exciting group then please leave a message in the comment section. Thank you. I made a typical Mizo-style vegetarian bai with cauliflower stalks too, but had to add in several condiments to make it acceptable to our urban palates. Maybe I’ll try out your version some time. Thats’ true Priya, I too had to make it a bit more wholesome so that hubby would have it. I allowed the veggies to cook till done and added salt at the end. I loved the simplicity of the dish and I must say this is an extremely hearty healthy meal option for the entire family. Extremely fuss free recipe for summers! It definitely is Vidya and filling too because of the small amount of rice. Such a wholesome healthy bowl. I love the colours and I am sure it makes a perfect meal for hot summers. Thank you so much Anu. Such a resplendent dish with all its colours. It also fits perfectly into my healthy eating routine and is a great way to get so many vegetables included in one meal. It certainly is Aruna and so easy to make. This is certainly a wholesome soup with all those colourful vegetables going in ! Perfect treat for the entire family ! Thank you so much Renu and please do try it, its simple and healthy. Thank you so much Sasmita, I did not allow the veggies to cook too much and added salt at the end.